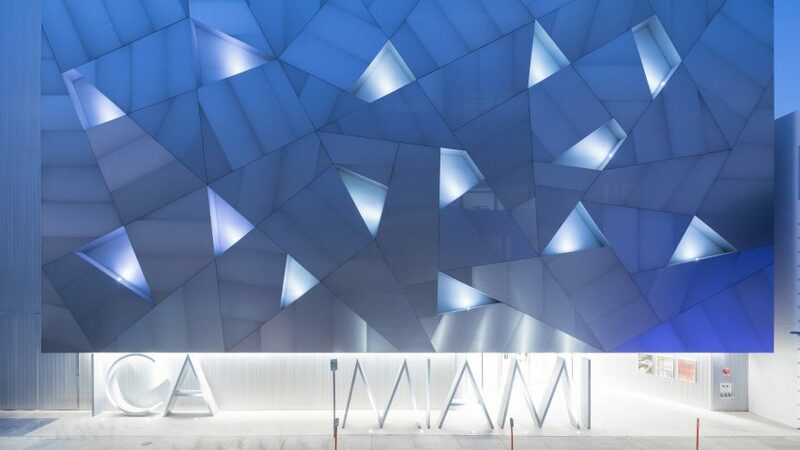 Miami's Institute of Contemporary Art has opened its dedicated building in the city's Design District, featuring a metallic facade designed by Spanish firm Aranguren + Gallegos Arquitectos to act as a "magnet" for visitors. The ICA is now welcoming visitors to its new permanent home, after operating from the historic Moore Building close-by. The opening coincides with Miami art week, which includes the Art Basel and Design Miami fairs – along with a host of concurrent events. Aranguren + Gallegos Arquitectos designed the building on NE 41st Street, in the growing Miami Design District – already home to many luxury fashion stores, restaurants and exhibition spaces. The task for the studio was to create a museum that could compete with other aesthetically bold structures in the area, but also blend into the surrounding neighbourhood. "The ICA museum wants to attract and be a magnet for the public, and generate a curiosity and interest," architects María José Aranguren Lopez and José González Gallegos told Dezeen, speaking through a translator. They took this idea literally and used geometric metal panels to clad the building's street-facing south facade. Some of these panels are set back slightly, allowing cove lighting to illuminate them at night. "The building had to have a strong personality and character, and the materials are the ones that give the personality to the building," the duo said. "The magnetic idea – the mirror, the metal – it had to be elegant and unique." At the base, ICA MIAMI is spelt out with tall metal letters. Visitors walk past these to the entrance, which is recessed under an overhang to draw people inside. The minimally decorated lobby leads directly through to a sculpture garden at the back, which can be enjoyed by anyone as part of the museum's free-admission policy. Gallery spaces occupy the building's three double-height levels, which each have open and flexible floor plans to be arranged as required. Each floor overlooks the sculpture garden and verdant neighbourhood beyond, through glazing spanning almost the entire north facade. Blinds can be rolled down over the windows to limit the amount of light that enters. "There was a demand that the spaces for exhibitions had to be big and really flexible, and with a very neutral character," said the architects. Unlike many museums, the ICA has no provision for an auditorium or a cafe. Instead, its outdoor space will be used to host talks and events, and visitors will be directed to nearby eateries if they are hungry. ICA Miami was Aranguren + Gallegos Arquitectos' first project in the US, which proved challenging for the Madrid-based team. "It is really different to work here," they said. "In Europe and Spain, we are used to the complete process of the project – from the initial concept to the design of every construction detail – and following the work site personally, controlling every detail and material, every edge of the building." "At the beginning, we were a little bit scared," the duo added. "We didn't know how to build a building without being present every day on the work site." However, with the help of local firm Wolfberg Alvarez, they were able to complete the build to their liking. "We have conceived a building that is itself a piece of art for the city, but the artists are really comfortable inside the building," Aranguren and Gallegos said. Miami Design District is the brainchild of local developer Craig Robbins, who has brought brands like Tom Ford, Dior, Panerai to the area, which is north of the city's Downtown area. Along with the ICA opening, the new neighbourhood is hosting numerous events during this year's Miami art week, unofficially taking place 4 to 10 December 2017.